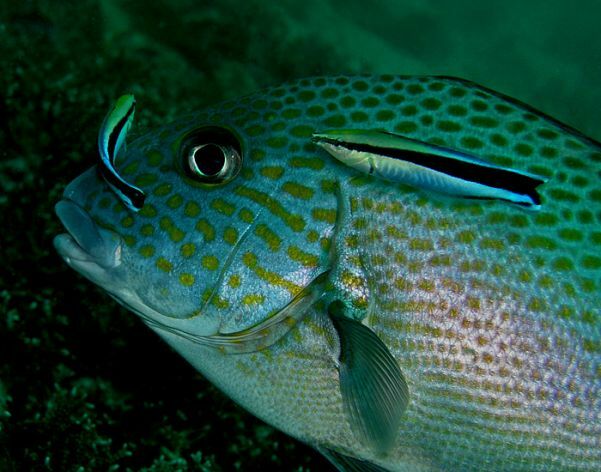 Two cleaner wrasses, Labroides dimidiatus, working a sweetlips. Photo by Nhobgood, courtesy Wikimedia Commons. 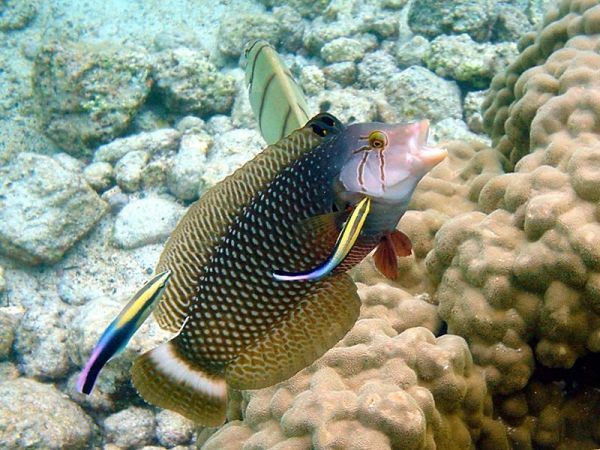 New research out on one of my favorite subjects—cleaner fish and their mimics. For starters, here’s a smart video showing the world of cleaners—fish and shrimp—and their clients in the seagrass beds and coral reefs off Papua New Guinea. Cleaners do occasionally bite their clients too hard (some actually sneak a forbidden ?sh scale now and again), which can lead to them being chased away by the angry client. If the injured client returns later to this same cleaning station, the cleaner will spend the ?rst few moments backing gently into him and massaging him with undulating caudal ?ns. The client appears to enjoy this, and the researchers conclude that it is an attempt at reconciliation—an apology, if you will, and the ?rst of its kind seen in anything other than mammals on the order of primates, dolphins, sheep, goats, and hyenas. Bshary also discovered that cleaners are more likely to use caresses to mollify carnivorous ?sh who might eat them. But what of the nonpredatory client species, the vegetarians who can’t wield the ultimate threat? What is to stop the cleaners from nibbling their ?sh scales, or nipping a little muscle tissue, or slurping an energy-rich slick of mucus? Another study revealed that market forces shape the cleaner-client relationship. Curbing what might otherwise be an overwhelming temptation to imbibe some of the client’s protective mucus is the pressure of competition. Clients are less likely to visit cleaning stations where they have previously been cheated by the cleaner’s nibbling, or where they have had to wait in line. So even nonpredatory clients wield the big stick of consumer choice. A dragon wrasse, Novaculichthys taeniourus, getting cleaned by rainbow cleaner wrasses, Labroides phthirophagus, on a Hawaiian reef. Photo by Mila Zinkova, courtesy Wikimedia Commons. If you spend long enough in the company of cleaners on the reef you might ?nd yourself a victim of one of the inevitable opportunists: the false cleaners, or mimic blennies, small ?shes who make their living as cleaner mimics (some only in their juvenile phase). These little predators look uncannily like cleaner ?shes, with blue stripes and long, narrow bodies. They even abandon their wriggly blenny swimming style for the cleaners’ characteristic rowing with the pectoral ?ns. Even more remarkable, some false cleaners have stolen the barbershop-pole display, the trademark of the cleaner wrasses, to lure the unsuspecting and the disheveled close by. When a victim falls for the ruse, the false cleaner charges, bites off a hunk of ?esh with fangs hidden in its underslung lower jaw, then runs to hide in a cranny. The scale-eating blenny is renowned for darting up from the substrate and nipping at passing divers. Now Andrea Bshary and Redouan Bshary have a new paper out in Cell Biology describing how some victims of parasitic saber-tooth blennies spend valuable time and energy punishing their attackers by chasing them or biting them—even though there’s no getting back that lost flesh. So when does it make sense to punish, given that punishment has immediate energetic costs to both the punisher and the punished? A key challenge for evolutionary biologists is to determine conditions under which individuals benefit from a contribution to public goods. For humans, it has been observed that punishment of free riders may promote contributions, but the conditions that lead to stable cooperation based on punishment remain hotly debated. Here we present empirical evidence that public goods may emerge as a by-product of self-serving punishment in interactions between coral reef fishes and parasitic saber-tooth blennies that stealthily attack their fish victims from behind to take a bite. We first show that chasing the blenny functions as punishment, because it decreases the probability of future attacks. We then provide evidence that in female scalefin anthias, a shoaling species, punishment creates a public good because it increases the probability that the parasite switches to another species for the next attack. A final experiment suggests that punishment is nevertheless self-serving because blennies appear to be able to discriminate between look-alike punishers and nonpunishers. Thus, individuals that do [not?] contribute to the public good may risk being identified by the parasite as easy targets for future attacks. ‘Cleaner’ Pt. 2 from MORPHOLOGIC on Vimeo. Finally, here’s another memorable video from Morphologic showing a Periclemenes pedersoni shrimp cleaning its host sea anemone, Ricordea florida corallimorphs.